Village Signs is a series of caches based on the ornate signs that depict the heritage, history and culture of the villages that put them up*. This cache is a simple two stage multi, starting at the Stoke Mandeville Millennium Sign at the above co-ords, near where parking is also available. Stoke Mandeville is a village and civil parish within Aylesbury Vale district. The village was originally recorded as Stoches in the Domesday Book of 1086, from the Old English word stoc meaning an outlying farm or hamlet. 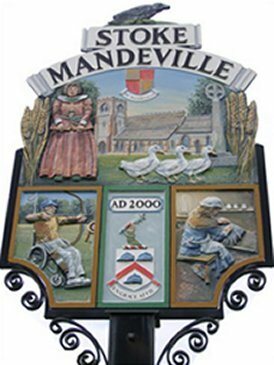 The suffix Mandeville was first recorded in 1284 when the manor was listed as being in the hands of the powerful Norman de Mandeville family. The name Stoke Mandeville these days is synonymous with the world renowned National Spinal Injuries Centre at Stoke Mandeville Hospital, which was the birthplace of the first disabled games in 1948, which have evolved into the Paralympics we know today. The Village Sign reflects this association, with the wheelchair-bound archer in the lower left panel. Lower right is a lace maker, which was once a popular cottage industry in the area, and between them is the arms of the Brudenell family. The top panel shows the Victorian St Mary’s church, just across the road from the sign, with in the foreground three Aylesbury ducks to represent the close links with Aylesbury and the fact that for many years Aylesbury ducks were reared in Stoke Mandeville. On the left of the top panel is Dorathye Brudenell, a member of the Brudenell family who were extensive landowners in the village from 1409 to 1639, who died in somewhat mysterious circumstances, along with two younger brothers and a younger sister. A white marble statue of Dorathye, a life-sized recumbent figure is now in St Mary’s church. Also in the main panel are the arms of the De Mandevilles - a simple shield of red and gold quarters. In 1254 Geoffrey de Mandeville held the whole of the village previously simply known as Stoke. On either side of the main panel are ears of corn to represent the agricultural history of Stoke Mandeville and the cottage industry of straw-plaiting which was very common in the 19th century. At the top of the sign is a crow in recognition of the old saying about the village "Stoke, where there are more crows than folk". The Stoke Mandeville Millennium sign (of which both sides are the same) was commissioned by the Parish Council and designed and produced by Mr Brian Gaze of Ixworth, Suffolk. Now, on to the cache. On the post supporting the Village sign is a rectangular brass plaque, below which are three oval plaques, each bearing a year.